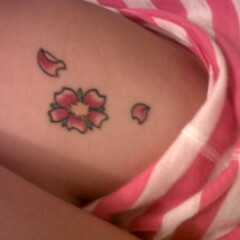 Japanese tribal style cherry blossom tree done a girl’s back with brightly inked red flowers and green leaves. Trees make great full back tattoos because the branches can curve and twist around the body without distorting the design. This cherry blossom tree has a bright brown trunk with black detailing that starts out thick at her lower back and then thins out by the branches at the shoulders. The red and white cherry blossom flowers have a unique design. Little kelly green leaves add even more bright color to this Japanese tribal style tattoo. 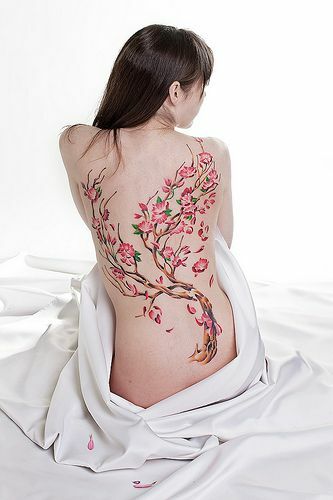 Cherry blossom trees are considered to be a rare beauty in Japanese culture and are a cause for celebration when in full bloom like this girl’s design.